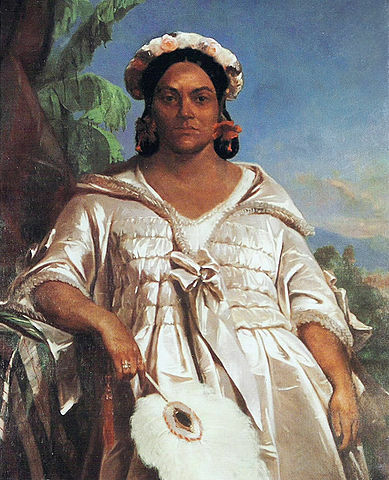 Queen Pōmare IV of Tahiti (1827–1877). November 25th . - In the evening four boats were sent for her majesty; the ship was dressed with flags, and the yards manned on her coming on board. She was accompanied by most of the chiefs. The behaviour of all was very proper: they begged for nothing, and seemed much pleased with Captain Fitz Roy's presents. The queen is a large awkward woman, without any beauty, grace or dignity. She has only one royal attribute: a perfect immovability of expression under all circumstances, and that rather a sullen one. The rockets were most admired, and a deep "Oh!" could be heard from the shore, all round the dark bay, after each explosion. The sailors' songs were also much admired; and the queen said she thought that one of the most boisterous ones certainly could not be a hymn! The royal party did not return on shore till past midnight. I understand the representative from the Tahiti National Party was turned away at the last minute.